We've played venues as large as the 2000-seat Portsmouth Guildhall and as intimate as Residents' Lounges in Sheltered Housing complexes. We've played in Central London... as far South as Bournemouth... as far North as Cambridge... as far West as Bath... as far East as, well Cambridge again! On the way, we've raised £75,287	for local good causes. There are photos from the event in our Photo archive. The concert raised about £450 for The Fusion Fund - their big building project. There are photos from the event in our Photo archive. The concert was amazingly well attended and raised £763.80 for The Listening Place, a counselling service. This was the final festival under the leadership of Fr Mike Sheffield who retired soon afterwards. He has left an inspiring legacy - a vibrant festival that pulls in massive audiences each day of the festival. We were invited back to Queen Mary Hall by Basingstoke Lions, this time for a full-length concert. For the first time in ages we don't have any photos of the event. We returned to Petersfield Festival Hall, this time as guests of the Petersfield Lions,	taking the middle of a 3-act spectacular. We were booked for a private concert at Homewater House Waterlooville - what a fantastically fun evening that was! We were guests of St John's Church at Rowlands Castle, for a concert in aid of their Church Rebuilding Fund. And since, by cruel coincidence, the Church was closed because part of the ceiling had fallen in, the much-needed fund-raising took place next door in the light and spacious modern Church Hall. We played at the Community Centre Hayling Island. Our concert was in aid of 3rd Hayling Scouts and supporting their representation at the World Scout Jamboree. We played at Queen Mary's Hall, Basingstoke in a concert for Basingstoke Lions. We took the first half of the concert, and the Basingstoke Rock Choir took the second half. Invited back for our fourth visit, we played in the lovely venue of Cornerstone - Hythe URC - on the edge of the New Forest. Our concert was in aid of their Outreach appeal and we raised £280 after the cost of the excellent refreshments was deducted. The Dorset Guitar Society booked us to play at the Kinson Community centre, Pelhams Park, on the outskirts of Bournemouth. The Mayor of Eastleigh booked us to play at The Point Eastleigh, in aid of his fund-raising appeal. With Christmas a few days in the future, we returned to Nicholson Gardens, one of Portsmouth's Sheltered Housing complexes for an evening of Carols and some good-natured heckling! Another "return concert" - this time at Four Marks - our third fund-raiser for "Friends of Boundaries Surgery"
Just a note to thank you and the rest of the HAGO for giving us such a wonderful concert on Saturday. Both Peter and I thoroughly enjoyed the performance and thought the programme of music a really nice mix. There may not have been a full house but those in the audience certainly seemed to enjoy it too. We have had some good positive feedback. You will be interested and hopefully pleased to know that we cleared £470 after your expenses so we were very happy with that. A tremendous result in the end so thank you for all your help in achieving this. We really appreciate you all playing for us and giving up your Saturday evening - specially on a Dr Who night and in a cold church! Thank you once again and very best wishes with your forthcoming concerts and future fundraising. We returned to the Methodist Church at Salisbury for a second concert in aid of "The Listening Place" - a counselling service for the residents of Salisury, raising £585 for their Appeal. We played a fund-raising concert for the Havant-based "Off The Record" charity, which provides counselling and advice for young people. Hello Derek and the wonderful guitar players of HAGO, what an amazing concert you gave in aid of Off The Record on Saturday. It was a full house. Good luck with your future concerts - you do a cracking job entertaining and with on-going fundraising for worthwhile charities across the south. Keep up the good work. We returned to Cambridge again for another joint concert with Cambridge Guitar Orchestra. See more photos in our Cambridge Guitar Orchestra gallery. We played at West Sussex Guitar Club in aid of their Club funds, raising £167 for them. "Brilliant concert Derek and HAGO - enjoyed every minute. By the way, that beautiful old guitar belonging to Brian Whitehouse that we spoke about in the interval is a Santos Hernandez"
"Hi Derek, Thank you for the great evening. It was certainly a memorable evening." "Many thanks for a most enjoyable concert this evening." "What a fantastic evening with the Hampshire Guitar Orchestra (HAGO). Looking forward to listening to them again soon." "Just wanted to drop you a line to say thanks to you and the orchestra for a really enjoyable concert. As I mentioned to you during the interval the acoustics were so much clearer than at Farnham - the acoustics and intimacy were such you could hear all the individual instruments, the twiddly bits, the harmonies and the crescendo's really did crescend!!" "Many thanks for a most enjoyable concert - wonderful light music superbly played (& arranged) & a lot of fun for both audience & orchestra." Another "return visit", this time to the Royal Star and Garter Home in Richmond, for another moving and uplifting concert with some lovely and special people. This will be our last concert in this magnificent venue - S&G are moving to purpose-built accommodation in Surbiton at the end of July. Visit our 2013 gallery for photos from the day. The concert raised £490 for the Performers Together fundraising project - a new arts facility in Farnham. "I don't know if you noticed saw me, but I was the on the second row, with a contented smile on my face, absolutely enraptured! All your guitarists were spot on, led by a terrific maestro. " "What a wonderful concert tonight in Farnham. You are an amazing group of guitarists. We thoroughly enjoyed it. Thank you, very much." We again played a short concert of Christmas Music for the residents at Nicholson Gardens Sheltered Housing complex in Portsmouth. Always a fantastic evening with lusty singing and lots of good-natured heckling! We were thrilled to be invited to open the second act of the Loyal Variety Show at The Kings Theatre Southsea. This was a fund-raising evening in the memory of Joyce Brown, who was herself a keen fund-raiser for The Kings, and a fan of ventriloquist Steve Hewlett, who set up the entire event. £2000 was raised, and split 50:50 between the Portsmouth Brain Tumour charity and the Kings Restoration fund. We've uploaded a video of one of our pieces. We had a fantastic concert in Bedhampton in aid of Canine Partners. It was hosted by Havant Rotary Club and raised over £700 for the charity. "Great concert last night, loved the music"
"I think it was a sell out or pretty near it tonight. Thanks for working with Havant Rotary Club to raise money for canine Partners." "We had the pleasure of selling our The Rhubarb Tree wares at the interval of this Hampshire Guitar Orchestra (HAGO) concert for Canine Partners on Saturday. What a great evening! Check out their video, they were brilliant!" Another "return visit", this time to the Royal Star and Garter Home in Richmond, for another moving and uplifting concert with some lovely and special people, this time in the morning, so an earlier start that we're used to! Unlike last year, we decided that a "Picnic in the Park" was perhaps a poor idea, in view of the many days of torrential rain, but we did find a very accommodating pub just round the corner than not only provided some excellent food, but fabricated a large square table in a separate area so that we could all eat and chat in comfort. The concert raised funds for Havant Women's Aid and featured (wait for it) a pith helmet. Read our special 100th concert celebration page and you'll see photos and videos from the evening. "What a fantastic evening we had at HAGOs' 100th concert - in Portsmouth. Thanks to you all"
"HAGO's offering was excellent. We both thoroughly enjoyed it!" "A fabulous evening - great music & entertaining leadership"
The concert raised £678.19 for the Hospice. "It really was a fun night." The concert raised almost £650 for the local Hospice. "another excellent production - HAGO gets better and better "
We returned to St Cuthbert's in Copnor. Last time we played, in April 2008, we were in the upstairs room. This time, we were the first concert to play in the refurbished Church. Thank you all for a wonderful concert last night in Copnor - chilly, but you battled on bravely! You really are the 'best kept secret' in Hampshire!! We need to 'blow your trumpet for you' - will try & get that organised!! Thanks again for a fantastic evening. We were invited to the Methodist Church in Salisbury to play a concert in aid of The Listening Place. ...our most grateful thanks for the splendid concert that hago presented for The Listening Place funds at Salisbury Methodist Church on Saturday 15th October 2011. The individual and combined musical sounds from the orchestra were both sweet, enchanting, and in some cases, surprising, with many spectacular multi-note combinations and chords. Please convey our thanks to your members for a very special and extremely enjoyable concert. Yet another "return visit", this time to the Royal Star and Garter Home in Richmond, for another special concert with some lovely and special people, this time in the morning, so an earlier start that we're used to! It was our turn to invite Flautissimo over to our home territory this year, and we enjoyed the chance to play a concert featuring different sizes of flute as well as different sizes of guitar. The concert was held in St George's Portsea, a wonderfully reverberant and light church. My first of hopefully… many more Hago concerts was sparkling musical joy. I could have listened to them all night long. To remind me of the lovely music of the evening, I’m even going to change my “ring tone” to Left Bank 2. It was our biennial trip to Cambridge again to play a concert with our good friends the Cambridge Guitar Orchestra. Well Derek, just about recovered from the weekend. It was a wonderful occasion and really did live up to my billing of it being the highlight of our year. I think we really do have something special between our groups and it's lovely to see. We were delighted to be asked to play at St Peter's Church Titchfield in aid of "The Titchfield Bonfire Boys" and "Friends of St Peters". Thank you all so much for a brilliant evening. I heard so many comments from people saying how much they appreciated your music and enjoyed your humour. It all culminates in a different and special evening. Thank you again for your professionalism and supporting us. Fantastic concert tonight again! Thank you. Especially liked Penny Lane and the Westlife one. Couldn't stop myself from singing along (in my head of course)! It was very professional. Amazing playing. We played a short concert of Christmas Music for the residents at Nicholson Gardens Sheltered Housing complex in Portsmouth. Always a fantastic evening with lusty singing and lots of good-natured heckling! What a splendid concert you performed again for us this year - thank you all so much. Will be in touch as soon as the buckets and gift aid envelopes have been opened - as you know the envelopes are opened by headquarters staff so that will take time! Kind wishes and thanks again to you and everyone for a great evening. A concert by a popular guitar orchestra raised hundreds of pounds for the Rowans Hospice, Purbrook. We were invited back to Cornerstone - Hythe URC for a return visit as part of their monthly concert series. It was our most pleasant duty to perform with Cambridge Guitar Orchestra at St George's Portsea, as part of the Portsmouth Festivities. We were invited back to St George's to play a concert in the Waterlooville Music Festival. Phil Jones and Douce Ambiance started off the concert which was billed as a special "Double Guitar Bill"
It was a great thrill to play at The Olivier Theatre, Bedales School Petersfield, in aid of "Friends of Sheet School"
Great concert last night. Left Bank 2/Vision On was sounding particularly sweet – love to learn that! I enjoyed the Concert on Sat. at Bedales. People around me were really having a good time as was I. We played at Emsworth Baptist Church in aid of their Building Fund. It was a great thrill to play a concert with Flautissimo at the Turner Sims Concert Hall. An absolutely brilliant Concert as always - thank you to everyone for making the evening possible and for supporting The Rowans Hospice. Peter Kelly (vicar of Swanmore) has written to me: "Everyone here thoroughly enjoyed HAGO yesterday". I can now confirm that Hago were kind enough to raise £807-41 at the recent Concert held in Swanmore supporting The Rowans Hospice - we are absolutely delighted with the result and would like to thank everyone for making this possible. May I take this opportunity of wishing all at Hago a very Merry Christmas and many best wishes for the New Year. Following on from our April concert, Sir Michael Moore asked us over to Portchester as part of the concert series at St Mary's Church, in the grounds of Portchester Castle. The concert was a sell-out, and we performed sideways on in the main body of the Church to give the audience the best possible sound. It was a great thrill to be invited back to Portsmouth Guildhall as guests of the Milton Glee Club again at their autumn celebration concert. I enjoyed your programme and sense of humour. I found Eternal Flame played by your guitars very moving indeed. I hope we can perform together again in the future. We were invited to return to the Church of the Good Shepherd at Four Marks near Alton, to perform a second concert in aid of "Friends of Boundaries Surgery"
Many, many thanks...it was a brilliant concert and yes they were a cool audience. Anyway it was a fun night, we made money and lots of people looked at our leaflets etc. We played at the western Edge of Fareham in aid of Church Mission Funds for St Columba's. It was a great pleasure to spend another weekend in Cambridge sharing a concert with Cambridge Guitar Orchestra. My thanks to you and everyone in HAGO for your marvellous contributions both musically and otherwise to the concert on Saturday. Its sad that we have to wait another year before we meet again - If only we lived closer to each other. We drove over to Quarley, just west of Andover at the invitation of Four Parishes Arts Society. I meant to write last week to say how much everyone enjoyed your orchestra and the music that they played. It was a most successful evening and we were able to give a more generous cheque than we first anticipated to the Alzheimer's Society. Various members of the audience were particularly complimentary. It was a great thrill to be invited to the Royal Star and Garter home at Richmond for a short afternoon concert for the residents. Many thanks to you all for a splendid concert on Saturday. Everyone was buzzing with it afterwards and feedback has been very positive. You are all such a lovely bunch of people too- a real pleasure to have you. As you quite rightly said, some of the pieces will stay in our minds for a while to come. You may already know this but the Germans have a word for a tune that 'gets stuck' in your head- they call it an earworm. I have an earworm of Elizabethan Serenade! (Makes a change from some of my usual suspects). It was a great thrill to play at West Sussex Guitar Club in aid of their Club Funds. You can watch some of our performance on video. Thank you for a very enjoyable concert last night. You could tell from the enthusiastic applause that the audience really enjoyed themselves (mayors included). There was a mix of superb music - much not heard for a very long time and brilliant arrangements. The mix of guitar sizes meant that with some pieces (Elizabethan Serenade) if you closed your eyes you would not have known it was just guitars playing. Please convey our thanks to the orchestra for a very enjoyable and fun evening. I am sure the new faces in the audience will return. Above all many thanks for helping to sponsor our club! That was a very kind gesture. St Leonard's Church, Sherfield English, puts on concerts through the year, and we played in aid of restoration funds. The United Reformed Church at Hythe have a regular concert series; we played in aid of their rebuilding fund. We have also had a wonderful evening being entertained and enchanted by the Hampshire Guitar Orchestra which was supported by over 100 people and contributed £842 to the building fund. We played a short concert of Christmas Music for the residents at Nicholson Gardens Sheltered Housing complex in Portsmouth. There was a fantastic reception and we were immediately booked again for 2009! Our now traditional concert for The Rowans Hospice moved to a larger venue this year - St Nicholas at Wickham. And what a concert - we raised a fantastic £1450 for the Hospice. It was a bitterly cold evening that saw us drive to the top of an exposed hill at Catherington for their All Saints Concert on All Saints Day at All Saints Church! Please pass on our sincere thanks as well to each and every player. The music was wonderful - you all make it look so easy (surely the mark of a player's skill?) and there were many comments this morning about how varied are the styles you play and how lovely the music was. There were 77 people in the audience. More than I expected came on the door, which was amazing seeing the weather, and I have given £545 to the church treasurer today. Thank you again for helping us to raise more than I had hoped. We hope to see the orchestra again on a warmer, summer evening before too long. It isn't always cold in there! I am writing both on behalf of the organisers and the parish for your concert on Saturday night. The music was very much appreciated by all who came, and we counted 98 in the audience, the best audience figure for the entire festival. So again thank you and your entire team for the wonderful music and such an enjoyable evening. The feedback from the audience as they were leaving was really buzzing. I hope you got some of that directly on the evening. The highspot of our performances this year was undoubtedly at the Station Theatre, Hayling Island at a concert organised by HIADS (Hayling Island AmDram Society). The purpose-built auditorium was pretty much sold out to a wonderfully enthusiastic audience, and we garnered a fantastic review which you can read here. September saw us perform a short concert as part of an evening of music held by the Salvation Army in Southsea. All Saints Denmead run a regular concert series all year long, and we were delighted to play a concert for them, moreso because we were able to welcome Bruce Paine, who played in the back row of our orchestra, and also reprised "Schindlers List" with us - you can see our original performance from 2005 on video. There's more about Bruce in our 2005 Bruce Paine gallery. It was our most pleasant duty to perform with Cambridge Guitar Orchestra at St George's Portsea, as part of the Opening Night of the Portsmouth Festivities. We returned to St George's for the Waterlooville Music Festival at the invitation of the organisers to present a full-length concert as part of their week-long festival of music. We played in aid of the Church Regeneration project at St Cuthbert's Copnor, in which the Church has been rebuilt internally to provide a Doctors' Surgery, a Nursery, and several other rooms, including the dome-shaped room in which we played. And despite all these additions, the Church itself still retains a wonderfully open building for worship. Thanks again for a great evening. The feedback has been excellent. We raised £950 for the United Reformed Church, Hayling Island at our concert there. We returned to St Nicholas, North End, this time to raise money for Chernobyl Children's Lifeline, a charity that provides UK holidays for children living in the fall-out zone of the Chernobyl nuclear power station. Our concert at St James Without-the-Priory Church Southwick raised £934 for the Rowans Hospice. Park Place is a Pastoral Centre run by the Franciscan Sisters of Mary and the Angels. It's a French Order of Roman Catholic Nuns which is now largely made of up Indian Nuns, due to the large amount of Missionary work in India. Their worldwide work is now co-ordinated from Park Place and they work in many medical and educational centres in India, in amongst the families of lepers in Ethiopia and among the street children in Brazil. The Church of the Good Shepherd at Four Marks is a wonderfully spacious and light venue, which saw us playing for the Friends of Boundaries Surgery. We made £430 clear for our funds - I waited until I knew the final amount before I sent this. So again thank you. It was a thrill to play in a concert organised by Milton Glee Club, supported by the Central Band of the Royal British Legion, at the 2000-seater Portsmouth Guildhall. We returned again to the Birdman of Bognor. There are lots of photos in our Birdman of Bognor Gallery, where you can discover just how daft this event is! St Faith's Church in Havant is an historic building with massive costs involved in its preservation. We played a concert there in aid of its restoration fund. "On behalf of the Appeal Committee I am writing to thank your Orchestra for the concert you gave in the Church and I do apologise for not having written to you sooner. It really was a splendid evening, very much enjoyed by all who were able to be there on the night and, when word got round afterwards as to how good an evening it had been, there were many people who regretted that they had missed it. We thought your programme was excellent and very varied, and "Rhythm of Life" went down very well, particularly with Sandra, our Church Warden, as it is one of her favourites. We like to keep her happy...! So, thank you very much for such a very good evening, sprinkled with your jokes which we liked and music we all enjoyed listening to"
We returned to Cambridge for another concert with Cambridge Guitar Orchestra, directed by Peter Rueffer - see more photos in our Cambridge Guitar Orchestra gallery. Our concert at St Simon's Southsea was in aid of Street Pastors. A Street Pastor is a Church member with a concern for society - in particular young people who feel themselves to be excluded and marginalised - and who is willing to engage such people. The role is one of listening, caring and helping - providing real assistance to those who feel society is ignoring them. It all turned out to be a great evening with everyone really enjoying your unique sound and humour of Hago! Fundswise it was very successful and after costs we have raised £500 that will sponsor 2 Street pastors to be out on the streets for 2 years! Hope all goes well in the next Cambridge Concert. We journeyed to the United Church in Winchester for a concert in aid of Retinitis Pigmentosa. The grand total is more than I thought it was going to be. Everyone seemed to enjoy themselves I think everyone is a winner. I was very pleased with how smoothly things went last night. I don't think it could have gone better - I had lots of helpers, and we were all packed up and gone by around 10:15pm. And it really was nice to hear the guitar once more. Thank you. Last night wouldn't have happened without you. I hope you realise how strong a force you are in making these events happen, and giving so much practical advice along the way. We returned to St James Emsworth, this time to raise money for the Salisbury-based charity "Hope & Homes for Children", which is concerned with helping find families for children left in overseas orphanages. Founded in 1994, the charity helps find homes for abandoned children in many poor countries. The concert was given in the presence of the then Mayor of Havant, Cllr Richard Brown. The evening included refreshments and a presentation by an overseas H&H representative, telling it how it really is. Hale Court is one of a number of superb, purpose-built, sheltered housing complexes situated on Portsea Island. This was our second visit to Hale Court, to an audience that joined in with everything we played, whether we'd intended them to or not, and despite many of the pieces being in the wrong key to sing! We were invited to help raise funds for St Nicholas's "Crisis at Christmas" appeal in a concert on December 2nd 2006, in the spacious church in Battenburg Avenue, North End. An audience of about 70 people raised £340 for their charity, and it has to be said that their "spare clap" in Flingel Bunt was perhaps the loudest we've heard for ages! With a massive Christmas tree behind us making a rather pleasing backdrop, this was our first concert in 2006 featuring some of our Christmas music. hago were delighted to play in aid of The Rowans Hospice, raising money towards its running costs. The tiny church of St James Without-the-Priory Gate, Southwick was full to bursting - all seats sold! I would just like to say a very sincere thank you to you, and to all your group, for giving up their time last evening to present the most wonderful concert in aid of the Rowans Hospice - it was absolutely brilliant and much appreciated. The atmosphere and comments as people left the Church were very complimentary - I don't think anything quite like 'hago' has ever been performed in this Village before! hago were pleased to return to the spacious interior and generous acoustics of the Church of the Resurrection in Drayton, this time at the invitation of Age Concern, to play a concert in aid of their local fund-raising. There's no truth in the rumour that we were simply planning for our own imminent future! The concert featured the premiere, if that isn't too grandiose a word, of our latest addition to our repertoire - a real rock classic - Rocking All Over The World. hago were invited back to "Birdman" to provide music on the second day of the Birdman of Bognor competition 2006. In 2005, hago played on the pier, but this time we ensconced ourselves in the bandstand on the promenade and enjoyed the splendid weather - with temperatures not far from 25 degrees. Half a dozen microphones and some hefty loudspeakers ensured that we were audible and we enjoyed a constant audience who stopped by for several numbers on their way to the pier. See photos in our Birdman Gallery. July 8th saw a concert with our friends at Cambridge Guitar Orchestra in the visually stunning and spacious acoustics at St Agatha's Church. St Agatha's has been described as one of the most magnificent hidden architectural gems in Hampshire. This was the latest in our traditional "home and away" concert series with CGO. Our series began in 2002, and so this is our fifth celebration of music and friendship, which begins with a buffet tea and invariably ends at a local watering house. Highlight of the concert for many people wasn't the massive contrast in styles and repertoire that the two orchestras bring to every joint concert, it was the surprise appearance of CGO's new mascot, Derek the Chicken, who, with manic eyes and an overly large beak was said to have more than a passing resemblance to hago's Musical Director, Derek Hasted. Indeed, the passage of time since this page was written does indeed show revenge, as you can see in our Cambridge Guitar Orchestra gallery. hago were delighted to be invited to perform at the very first of what is hoped to be a long-running and regular series of festivals organised by St George's Church and with the simple aim of raising the profile of live music in Waterlooville. Unusually for us it was a Tuesday evening concert. We shared our concert with our good friends the Havant Clarinet and Saxophone Choir - HCSC 2, and the two halves of the concert were separated by an interval in which refreshments were available, courtesy of the many hard-working helpers that made the evening run so smoothly. The festival had events at lunchtimes and evenings for the entire week - from June 11th to June 18th - and in addition to a wealth of good music there were superb floral displays and exhibitions to visit during the day. "HCSC had the audience tapping their feet, and HAGO provided a complete contrast ..."
We think it's a compliment! "Everyone enjoyed the music, from young to old"
We were thrilled and delighted to team up with our good friends at West Sussex Guitar Club and with Amanda Cook for another Gala Guitar evening in the lovely and easily accessible St Paul's Church, Chichester. WSGC's Artistic Director, Sasha Levtov, introduced a large and varied first half showing guitarists from the young and novice level right up to teacher status, and taking in solos, duets, trios, quartets and a massive ensemble with 25 players. See pictures and hear soundclips in our WSGC Gallery. We were pleased to take part in a joint Concert at St Philip's, helping to raise funds towards the provision of disabled facilities in this architecturally important building. The first half of the Concert provided a showcase for the local and for the young talent within St Philip's and featured a variety of solo and accompanied solo performances on as big a variety of instruments. The programme tells the story. Following wine in the interval and a raffle in aid of the Church appeal, hago took to the floor for a real variety of styles all played on our 4 sizes of guitar and featuring some items new for 2006. The evening raised £202 towards their project. We played an evening of Carols and Music for Christmas at St Johns Court Sheltered Housing, in Portsmouth, in aid of the John Pounds Charity. "Lovely to see you last night, the residents are full of compliments, they really enjoyed the music and have asked for you to do it again"
Held on a crisp Christmassy evening, with fantastic views from the top of Portsdown Hill looking south over Portsea Island, the evening raised £397.60 for charity. This concert was organised by St. Mary Magdalen, Sheet, in aid of Cecily's Fund, a hard-working charity set up in the memory of Cecily Eastwood. Cecily was just 19 when she took a gap year before going up to university. Not for Cecily a year in the UK earning money to pay for Uni life - instead left her home in Oxfordshire to spend a year teaching in Zambia. When she arrived in the Zambian town of Kitwe, she found an organisation called CINDI, which helps AIDS orphans. The sadness in the story is that Cecily died months later, in a Zambian road accident. Her parents, Basil and Alison Eastwood set up Cecily’s Fund in her memory. To paraphrase a certain football commentator, this was a concert of three halves. Following a first half with 25 acts put on by members of the congregation, there was a supper and a presentation about the charity. hago played the second half of the Concert. We were thrilled to be invited to be part of the Birdman of Bognor event. You'd better visit our Birdman of Bognor Gallery, where all will be revealed! It was a great thrill to welcome New Zealand guitarist Bruce Paine to England and to a wonderful concert at the wonderful St Agatha's Church. There are photos and a video in our Bruce Paine Gallery. We were invited at short notice to play a concert at the large and impressive Church of St James, Emsworth, in aid of the Refurbishment of their Parish Hall. Well over 100 people attended the concert which was supported by a fund-raising raffle. The event raised £580 for their fund. Please thank all the members of hago for a wonderful evening. It's good when fundraising can be enjoyable. A return visit to The Rowans Hospice saw us give our third Rehearsital to raise funds for the Hospice. Last night was great, a lovely atmosphere created by hago once again. I think what works so well for the audience is the relaxed feel for the evening, a varied programme and your informative and witty banter, it even gets them singing. I really meant it when I said that hago just gets better and better, sitting in the audience all of the parts so carefully arranged came over very well to me. We headed back to Cambridge for our biennial concert as guests of Cambridge Guitar Orchestra. See photos from the event in our Cambridge Guitar Orchestra Gallery. We were invited to play as part of Havant Borough Council's "Nine Days in May - Making Waves" event. The concert was at St Faith's Church Havant, and the proceeds were in aid of their Restoration Appeal. St Faith's, along with many historic buildings, faces a constant challenge to maintain the fabric of the Church and to protect it from the ravages that weather and the passage of time inflict upon it. The Parish of St Faith's faces the additional, and what should be totally unnecessary, task of repairing the Church after mindless and gratuitous acts of vandalism, committed by those with no respect for the present, let alone the past. We were delighted to be invited to share a Concert with Highbury Area Band, organised by Cosham Inner Wheel with the aims of raising money for The Rowans Hospice and to provide a horse for the Fort Widley Equestrian Centre at the Peter Ashley Activity Centre, on Portsdown Hill, just north of Portsmouth. Highbury Area Band have a well-deserved reputation for musical prowess and their Musical Director, Steve Tanner, produced some searing crescendi and some poignantly beautiful reflective moments in an invigorating and thoroughly enjoyable programme. We just wanted to write and thank you very much for being part of the Inner Wheel Highbury Area Band Concert last Saturday. I think you must know from the enthusiastic applause that everyone enjoyed your spot in the programme immensely. You will be pleased to hear that some of us will definitely try and be at one of your Concerts soon. On that evening we raised £1030 for our charities this year. We are very pleased as you can imagine. We played at Queen Alexandra (QA) Hospital in Cosham in aid of their Rocky Appeal. I would like to wish you all a very Happy Christmas and a healthy New Year." We played an evening of Carols and Music for Christmas at Hale Court Sheltered Housing, in Fratton near Portsmouth. The managers at Hale Court donated £100 to a charity of their choosing in respect of our performance there. The money has been donated to Lloyd Scott who is raising money to help research into curing childhood leukaemia. At the time of our Concert, Lloyd had just completed a gruelling 50-day ride across Australia, perched on a penny farthing, and dressed as Sherlock Holmes. Lloyd is made of stern stuff, and in the past has "run" the London Marathon in a deep-sea diving suit, and has also completed the world's first underwater marathon - 26 miles in Loch Ness. hago were invited to play at the Bath Guitar Festival by IGF as part of the 1st prize from the sixth Guitar Orchestra Competition of Great Britain. Cambridge Guitar visited us for a second concert - the first was in 2002 - and we played at the spacious All Saint's Church in Portsmouth. See photos in our Cambridge Guitar Orchestra Gallery. We played an evening Concert at the Parish Church of St Thomas, Bedhampton, on 6th March 2004. The 12th Century Church, bathed in warm light by uplighters and candles, was a wonderfully intimate venue for a full-length Guitar Concert by hago. Proceeds from the Concert were given to the Parish Appeal, which is raising money to appoint a Children, Youth and Families worker. Once appointed, they will work with schools and voluntary organisations in the Parish to help those who, irrespective of their own religious beliefs, need support. The Concert raised £275 for the appeal, which, at the time of writing this page, has accrued enough money for the first year of appointment and is on its way to a second year. "Another very enjoyable evening. The church was a lovely setting." "Everyone in hago looks as if they love what they do." hago were delighted to be invited by Highbury Area Band to play a set in the Portsmouth Music Festival Opening Concert, in the presence of The Lord Mayor Of Portsmouth at the Church of the Resurrection, Drayton. Highbury Area Band are principal sponsors of the Portsmouth Music Festival, and make a large donation towards the expenses of the Festival via the ticket sales at the Opening Concert. The Band, which brings together some of the finest wind band players from the area, can transform itself into the Highbury Area Big Band, and their repertoire blends some of the finest classical music with some of the most foot-tapping up-tempo standards. The PMF Committee thanks you all so much for the excellent performance you gave yesterday in the Festival's Opening Concert. It was an excellent event - so much variety in style, timbre and dynamics, and so much of interest to watch. It was lovely to have you all with us, and you all looked so happy while you played - obviously enjoying yourselves immensely! I do hope to hear another performance soon, and look forward to seeing some of you at the Guitar Day. With my personal thanks as well as that from all the PMF and the audience in general. We met with our good friends from West Sussex Guitar Club, plus their guest Amanda Cook, to put on this joint concert, which attracted an audience of 148. 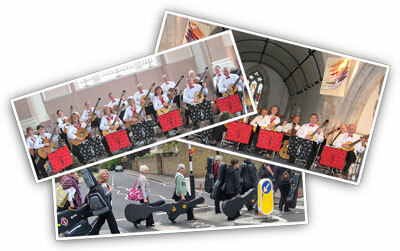 See photos in our West Sussex Guitar Club Gallery. Our Christmas concert was the first one that was separate from our MD's Guitar Workshop, and took place at the Rowans Hospice, in the form of another Rehearsital, this time with 19 items. The concert raised over £260 for Hospice funds. We journeyed to the Conway Hall, in Holborn London for the 6th Guitar Orchestra Competition of Great Britain. Our Summer concert, shared with our MD's Guitar Workshop, was at St Nicholas Church Centre Bedhampton. The concert raised £894 for The Rowans Hospice. At the end, MD Derek was presented with ten chickens. "Thank you for your letter enclosing donations of £894.64. This is a fantastic sum to have raised and we are extremely grateful ... please pass on my sincere thanks ... for such an excellent result. " Teddy Bears' Picnic - a snippet played by hago's Amber Saunders & Derek Hasted. Duet score for sale in The Shop! We played our first "rehearsital" in the Seminar Room at the Rowans Hospice, in aid of their general fund-raising. The audience was a mix of staff, volunteer helpers and a couple of patients, and raised £207. The event was a chance to preview the pieces we'd be playing a week later in our formal concert in aid of The Hospice. Following on from the success of our 2002 concert with Cambridge Guitar Orchestra, we travelled up to Cambridge to perform a concert at the Church of St Edward, King and Martyr, Cambridge, as guests of CGO. We were invited across to West Sussex Guitar Club to play a short Recital, followed by a Mini-Workshop that gave WSGC members a chance to sample one of our easier pieces - La Bamba - which is on sale in our Shop. See photos from the event in our West Sussex Guitar Club Gallery. Our Christmas concert, shared with our MD's Guitar Workshop, was at St Nicholas Church Centre Bedhampton. "Thank you so much - your support and generosity are greatly appreciated. Please pass on our sincere thanks to all your pupils and to the members of hago. Wishing you and yours a very Happy Christmas"
The concert raised £731 for The PSP Association. PSP - Progressive Supranuclear Palsy - is hardly a well known disease, and yet, with sad timing, it had caused the death of pianist and actor Dudley Moore, not long before our Concert. "We are absolutely delighted with your very successful fundraising and cheque for £731.70 to go towards the work of our Association ... It was good that a member of our Solent Support Group was there as a guest ... we are - and are likely to remain, a very small charity, for whom collections like yours are particularly important. Please thank all those involved very much." We organised the first of a long-running and enjoyable set of concerts with Cambridge Guitar Orchestra at the wonderfully spacious St Agatha's Church, Portsmouth. There are photos of the spectacular interior in our Cambridge Guitar Orchestra Gallery. Our Christmas concert, shared with our MD's Guitar Workshop, was at St Nicholas Church Centre Bedhampton. It was our MD's Silver Celebration - 25 years of teaching here in the Havant area. The Lady Mayoress and I would like to thank you and your players for your generous donation for my 'Kidney Care' Appeal. As you know, the Appeal aims to raise sufficient funds to purchase much needed equipment for the Renal Unit at St Mary's Hospital and this contribution will certainly help us to do so. Friday 13th (what an auspicious date) saw our first independent concert "hago and friends", held at St Thomas' Church Bedhampton. Our first concert of 2001 was shared with our MD's Guitar Workshop, was at St Nicholas Church Centre Bedhampton. "What a lovely surprise just before Christmas to receive your cheque as a contribution to the work of Canine Partners for Independence. On behalf of CPI may I say a huge 'thank you' to you and your players for making this donation possible, it really is most kind of you and much appreciated." Our first concert of 2000 was shared with our MD's Guitar Workshop, was at St Nicholas Church Centre Bedhampton. Our first Christmas concert, shared with our MD's Guitar Workshop, was at St Nicholas Church Centre Bedhampton. Our first ever concert, shared with our MD's Guitar Workshop, was at St Nicholas Church Centre Bedhampton. The concert was held on a Saturday (rather than the traditional Thursday) and included a large celebratory buffet.